"The northern terminus of Japan...here a northward drifting people comes to a full-stop." If, on one of those rare days of clear sky on Hokkaido, you were to head down to Cape Soya near the city of Wakkanai and stare northward across the waters of La Pérouse Strait, you might just catch a glimpse of a large landmass shimmering in the haze. The island, foreboding in its size, would hardly seem that distant - indeed, only 27 miles separates it from where you would be standing. And yet, this nearby landmass is not part of Japan. After all Cape Soya on Hokkaido is the most northerly point on Japan’s main islands, and the tiny island of Bentenjima, easily viewed directly off Cape Soya’s coast, is the absolute most northerly spot in uncontested Japan. So what could that further-off behemoth be? Among its many peculiarities, Japan is thought of by both outsiders and the Japanese as being particularly isolated, a major island nation whose very nature of being cut off from obvious borders with other countries and peoples has had an indelible effect on its history. Indeed, there is a much bandied-about word in Japanese, shimaguni konjo (島国根性, island country mentality) which is often employed to describe the unique mindset gained by a people who have lived so long in perceived isolation. When envisioning such a country, its hard to imagine that it might have a foreign neighbor within fairly easy view of its mainland. If we were to view the archipelago that makes up those Japanese main islands on a map - one on which no political boundaries or delineations were etched - the mystery might even deepen. The geographical flow of the island chain, from southwesterly Kyushu to the long northeastern sweep of Honshu, with smaller Shikoku nestled in the crook of the Setonaikai Inland Sea in its southeast, and then wide Hokkaido sitting North atop all these, would seem to extend beyond the borders we know Japan occupies. That large island across the narrow La Pérouse Strait which we’ve been contemplating up until now would be clear to see; a long, skinny landmass extending from near the tip of Hokkaido, over half as long as lengthy Honshu. In this view of the Japanese Archipelago, free of politics and governments and the byzantine intricacies of history, this island would appear as simply another part of the island chain - perhaps even as a fifth main island. And yet we know this island is not in fact part of Japan. Just who might be the owner of this sizeable spit of land, so close to the Japanese home islands? The answer, as anyone who owns a modern labeled map could tell you, is Russia. The island we’ve been metaphorically viewing is none other than Sakhalin, the largest island in the entire Russian Federation and 23rd largest in the world, the namesake of the Sakhalin Oblast, and--with nearly 500,000 persons--a major population center of the Russian Far East. For the past 74 years, this land has been indelibly, wholly Russian. And yet, its history is not so simple. A recent history of war, hundreds of years of Russo-Japanese border standoffs and a longer history still of indigenous settlement complicate the story of present day Sakhalin - which is not the only name by which this island has gone. Earlier, long before and during its period as Japan’s 48th and now-lost prefecture, it had a Japanese, Ainu-derived name by which some still refer to it: Karafuto. Karafuto; Sakhalin. Two names for a single place used by peoples who had inhabited the island, sometimes simultaneously, sometimes very much separately. But what’s in a name? Place names, and the etymology and related history that go along with them, can tell us much as to how people perceive the places they inhabit. Sakhalin, the Russian name for the island north of Hokkaido and East of Khabarovsk Krai in the Russian Far East, is a corruption of the Manchu name for a region at the end of the Amur River. The Manchus, native to the territories directly West of Sakhalin on the Asian mainland, would likely have known of the island long before the Russians first explored the East Seas, or the Yamato Japanese finally made their way that far northward. The Russians took the Manchu word for the Amur River, sahaliyan ula (Black River) used in describing the area, and corrupted it to Sakhalin -- thus the Russian word for the island is a mispronunciation of the word "Black" in Manchu. The Japanese word for the island, on the other hand, is Karafuto (樺太), said to come from the native Ainu language - "kamuy kar put ya mosir", meaning "the island a god has created at the estuary." "Kar put" became "Karafuto." And what of that island that the gods, in their wisdom, generously placed so near Hokkaido and yet also just almost touching the Asian mainland? It is vast in size, at 27,990 square miles the 23rd largest island the world, and yet a defining feature is its narrowness. Two large mountain ranges run a considerable length of the island, a valley between them. To the south, more mountains and geography perhaps comparable to that in nearby Hokkaido, and to the north a sort of boggy taiga akin to the lands of Siberia. The entirety of the island is known for its fogginess and the cold of its winters (and sometimes summers), but as befits a place so long south-north, the north of the island is significantly colder than the south, whose cold winters are slightly moderated by the warm waters coming from the Tartar Straight which separates Sakhalin from Asia. Such is the difference that winters in the north of Sakhalin last two months longer than in the south. Rugged beauty and abundant wildlife have defined Sakhalin since time immemorial, and even today one can often spot an individual from the over 2000 Sakhalin brown bears wandering into the outskirts of cities, scavenging for food. To the north there are reindeer, an animal unknown on the Japanese islands to the south, and which have served an important role in the lives of native Nivkh and Orok peoples of the land, who traditionally herded them. Off the coasts swim schools of whales; bowhead, gray, and right whales, whose baleen drew American whalers to the waters off Sakhalin in the mid 19th century. Even today, it is this natural beauty that often draws travelers to this remote place. In spite of this remoteness, it is the landmasses with which Sakhalin shares such close proximity that have so shaped its history. In Sakhalin’s far northeast the island comes closer and closer to the continent, with Cape Pogibi reaching out across the extremely narrow Neveskoy Straight, nearly touching Cape Lazarev on the Northeast Asian mainland. Here, only a scant four miles separate Sakhalin from mainland Asia (for comparison, the closest the four home islands of Japan come to the continent is 124 miles at the Korea Strait). In winter the freezing of the strait means that the journey to the island can be made on foot...should one dare. And some, it seems, did dare. Sakhalin has been inhabited since the Neolithic age, and its various peoples have arrived to the island either via this frozen bridge, the land that emerged from receding frozen seas during ice ages, or by boats from nearby islands. Over the many eons, three tribal people groups came to dominate the island. To its north lived (and indeed still live) the previously mentioned Nivkh, whose populations span across the narrow sea to the Asian mainland nearest Sakhalin, around the Amur River estuary. For their part, they seem to have migrated to Sakhalin during an ice age, when low sea levels ensured that the Strait of Tartary was dry ground, and Sakhalin but a peninsula of the Asian mainland. As the Ice Age receded and the waters rose, Sakhalin was separated from Asia - and the Nivkh population was split in two. Perhaps the last remnants of a very ancient original native people of the Amur region, the Nivkh are a linguistic isolate, their language unrelated to any other in the world. Semi-nomadic, they traditionally lived near the Sakhalin shores in summer, and would retreat inland during the freezing winters, riding sleds pulled by the hardy dogs they bred and trained. In the myths the Nivkh families would tell around their campfires, Sakhalin itself was a titanic bear, lying asleep in the sea with its stomach and legs turned upwards, the vast forests of the island being made of its hair. Whenever this bear became agitated, it would shake and roar - hence the earthquakes that wrack the island at intervals. (FWIW, This legend bears striking resemblance to the Japanese myth which similarly sees Japan as resting on the back of a carp, whose movements also cause earthquakes). To the East of the island live another people, the Oroks, whom call themselves Ulta. Later arrivals to the area, the Oroks are a Tungusic people, related to the various tribes throughout Siberia, the Russian Far East, and northern China who speak similar languages (the largest of their cousin peoples by far are the Manchus, one-time conqueror-rulers of China). Setting the Oroks culturally apart from these distant Tungusic cousins is their unique breeding of reindeer, a major source of food, hide, and transport for the Oroks. Finally, to the south lived one more separate people group; one whose overall domain extended deeper south into Hokkaido, and whose historic ties to Japan run deep - the Ainu. Most observers of Japanese history and culture will know of the Ainu, the last of modern Japan’s pre-Yamato indigenous peoples. Culturally and phenotypically different from the dominant Yamato Japanese ethnicity, Japan’s modern home island of Hokkaido was for hundreds of years their domain, a frontier island onto which the Yamato Japanese slowly encroached from their homelands to the south. Hokkaido was not the Ainu’s only domain, however; Ainu also lived for hundreds of years in the long Kuril island chain to Hokkaido’s northeast, and in large numbers on Sakhalin to Hokkaido’s north. The Ainu of Hokkaido, the Kurils, and Sakhalin all had district dialects and cultural aspects that set their communities apart from each other, but their major shared cultural traits included their hunter-gatherer lifestyle, the long beards worn by their men, and the tattooed lips on married women. They also held a reverence for kamuy, the living spirits that embody nature and physical objects, as well as an especial affinity for bears - something they may have inherited over time from their interactions with the Nivkh. Its easy for modern people to imagine these small tribes as having a simple, isolated lifestyle, and in some ways the daily lives of the Ainu, Nivkh, and Oroks may seem "Neolithic" - and yet the reality is that their societies were dynamic and interconnected, with important ties running between their own settlements on the islands in the region, as well as with the larger people groups on the mainland. The Ainu and the Nivkh in particular took part in a huge trading network that crossed the seas north to Kamchatka and which also saw goods from China and further west coming into Sakhalin, where they would be traded across La Perouse Strait to Hokkaido, and from there further south into Japan. In the 13th century the Ainu even attempted conquests on the mainland, fighting against Mongols who had recently conquered the Amur region. When the Mongols occupied Sakhalin, the Ainu even managed to besiege and oust them from the island for a time, before eventually being overwhelmed in the early 14th century. From there, Sakhalin fell under the sway of the Mongol-ruled Yuan Dynasty of China, becoming part of their tributary system. Under this system, seemingly subjugated foreign peoples paid tribute to the Chinese empire in exchange for trade and good relations, rather than being outright occupied and controlled by the Yuan. Ainu and Nivkh chiefs were even given Chinese titles and valuable silk clothing to signify their connection to China, and the Ainu trade network brought Chinese goods into Hokkaido and beyond. This sort of tributary relationship continued even as Chinese dynasties fell and were replaced by new ruling orders, from the Mongol Yuan Dynasty to the Han Chinese Ming Dynasty, and finally the Machu-ruled Qing dynasty from 1636. The Manchus even had a trading post on northern Sakhalin during the early days of their dynasty. To the slowly encroaching Yamato Japanese to the south, the mysterious northern islands beyond Honshu were all called by the name of Ezo - the same term they used to refer to the "barbarians" who lived in such lands. Hokkaido attracted Japanese attention early on, but if vast Hokkaido was a vague, barbaric land to the Japanese, Sakhalin, even more remote, lay under an even greater shroud of mystery. When the first major Japanese settlements on the most southern part of Hokkaido began popping up in the 15th century, the Japanese who lived there referred to the landmass north of their new home simply as Kita Ezo -- "North Ezo." To them, it, like the majority of Hokkaido, was the domain the Ainu. Whether Kita Ezo was even an island or rather a large peninsula stretching down from Asia remained a mystery to them. As the Japanese on Hokkaido solidified their grip on the island, they increasingly came to rely on trade with the Ainu as a lucrative source of foodstuffs, furs - and valuable foreign goods. The fact that the Ainu could supply the ruling samurai class of Hokkaido with high-quality Chinese silks - silks of even higher quality than what could be found in the main Japanese port of trade with China, Nagasaki - came to be of great interest to them. For the Matsumae Clan, which came to rule the Japanese part of Hokkaido from the early 16th century, these Ainu-bought Chinese goods became a mark of pride. When the first daimyo (大名, feudal lord) of the Matsumae Clan, Yoshihiro Matsumae, met with soon-to-be shogun of all Japan Ieyasu Tokugawa, he chose to wear an Ainu-supplied and eye-catchingly exotic Ming uniform to their audience. As a symbol of his domain’s unique positionality, it was very effective -- Ieyasu even inquired about the fine piece of Chinese clothing. Yoshihiro explained that it came "from deep northern Ezo; an island called Karafuto." Heartened by his liege’s interest in his unique vestments, Yoshihiro gifted the item to Ieyasu when he departed. In this way, a high-quality Chinese garment had traversed from the Amur delta on the Asian mainland to Sakhalin, been traded across the La Pérouse Strait to Hokkaido, had made its way into Matsumae hands in the Japanese-settled area of Hokkaido (known as the +Wajinchi+) and had finally wound up in the possession of the man who would be the founder of the Tokugawa dynasty, nearly 900 miles south of the Ainu lands. Karafuto, source of such highly-prized trade, had captured the imagination of the Matsumae samurai, hungry as they were for the status-enhancing lucrative goods that the island seemed to promise. The island could no longer remain isolated from Japanese attempts at control. While some seasonal Matsumae trading posts already existed on southern Karafuto, the daimyo wanted more. Expeditions were sent to survey the northern land, hoping to find sources of salmon and sea cucumbers that might be of value. In 1636, Kodo Shozaemon, a samurai of the Matsumae Clan, became the first Japanese to winter on the island. Such explorers relied on local Ainu for information about their surroundings, and engaged in small amounts of trade with them. These expeditions brought important information to their lords in the Wajinchi. Japanese exploration of Karafuto and trade with the local Ainu increased, especially after Matsumae victory over local Hokkaido Ainu in Shakushain’s War, a major Ainu rebellion in 1669-1672. As Hokkaido Ainu’s lifestyles became more and more dominated by the Japanese, Sakhalin Ainu continued to avoid this fate by dint of distance and lack of permanent Japanese presence. To Sakhalin Ainu, the Japanese were of less importance than the Qing or the Ming before them - they were but valuable trading partners from foreign lands who held small trading stations on their island. The reality on the ground slowly began to shift. The first real Japanese settlements in Karafuto came in the late 18th century, as fishermen began founding outposts on the island’s southern coast. Those who came to hear of this place began to imagine a vast island as a source of not only Ainu trade, but also massive amounts of natural resources - firstly fish, but later including timber, oil, and coal. This lead the Matsumae samurai to construct a permanent trading post in Shiranushi at the very southern tip of the island, as well as various guard posts around the area. This activity lead the Tokugawa Shogunate to begin to take more interest in what was occurring in distant Karafuto; the lines, they ascertained, has began to blur between simple trade with the Ainu of "Ezo" - "barbarians" with whom the Matsumae had special leave to trade with under the shogunal policy of isolation (鎖国さこく) - and a more transnational trade with the Asian continent via these Ainu on Karafuto. Meanwhile, even before the Japanese tried to control the island directly, the increase in demand for Ainu-provided goods proved to have devastating effects on Ainu communities in Sakhalin. Pressure from the Japanese to trade more furs for in-vogue Qing goods meant that the Ainu had begun to overhunt the naturally abundant Sakhalin environment. As the local populations of black fox, seal, and deer became overtaxed, Ainu could no longer take enough pelts to meet demand, and they inexorably went deeper into debt with mainland traders. In 1792, an envoy sent from the Matsumae came to Karafuto tasked with the mission of reporting on conditions there. He found many Ainu villages lying abandoned. When he inquired with traders he met with regarding this, they told him the inhabitants had been unable to pay their debts. In response, their lenders from the Amur Delta region recouped their investment the only way they could - by abducting the Ainu back to the Asian mainland as slaves. It was around this time that, suddenly, there appeared a new sort of foreigner in the region: the Russians. Their arrival signaled a sea change for the North Pacific, one which would see a flare-up in Japanese interest in Karafuto, and which signaled the end of effective Ainu, Nivkh, and Orok independence as their lands became the zone of contact between two powerful foreign entities. Arrival of the "Red Ainu"
Word came down to the Matsumae that a new group of foreigners, unlike any encountered before. were setting up trading posts in far northern Ainu territories in the Kuril island chain. The Matsumae did not yet know it, but this was the first sign of a new neighbor moving into town -- one they would eventually know as the Russian Empire. The sudden appearance of the Russians in these regions previously dominated by Tungusic, Nivkh and Ainu tribes had come about because of a remarkable shift in history. Russian territory had rapidly expanded in the two hundred years previous from a relatively small European duchy, dominated by a Mongolian rump state known as the Golden Horde, into a unprecedentedly vast empire that stretched from the Black Sea to the Pacific. As the Russians arrived in the North Pacific area, their desire for trade and for that greatest mark of colonial prestige -- subservient peoples -- led them to creating a similar relationship with the local people as had the Chinese and, more recently, the Japanese. The Russians, who were first known rather obliquely to the Japanese as the "Red Ainu" for their strange blonde hair and "similar" facial features to that other foreign group, were put on a collision course with the Japanese as they explored their newly acquired Far East. Their uncertain borders melded into the Japanese northern frontiers of Ezo, including the poorly mapped and still somewhat mutually mysterious area of the Kurils and Sakhalin. Their appearance in the region startled the Matsumae and the central Japanese government in Edo, as did attempts by the Russians to start up trade negotiations in Ezo in 1778 and 1779 (the Russians were instructed to trade using the Ainu as middlemen - direct trade with foreign nations was still prohibited). The Russians first landed in Sakhalin in 1783, when confusion about the exact nature of the island still prevailed, as Japanese and Russian maps both continued to misrepresent its geographical reality. (Japanese, Russians, British and French explorers continued to think of Sakhalin as a peninsula rather than an island. Only an overland expedition in 1808 by Japanese explorer Mamiya Rinzo finally confirmed it as an island, although French explorer Jean-François de La Pérouse, for whom La Pérouse Strait is named, had come to similar conclusions during a 1787 expedition). The continued Russian presence in the area and rumors of direct Matsumae trade with them prompted the central Edo government to become much more involved in Ezo and Karafuto. Such potentially volatile direct contact with a foreign power could not be left in the hands of the samurai leaders of a mere frontier domain, whose goals and motivations might not match those of the central shogunal government. In 1799 the Shogunate took over direct control of the region from the Matsumae, ending the centuries of control that clan had over trade in the far northern reaches of Japan, and bringing the area further into a centralized Japanese orbit. Impoverished, deeply in debt, and depleted in numbers by abductions by mainland traders, the Sakhalin Ainu saw the Japanese as potentially their only route of escape. Ainu officials decided to petition the Tokugawa to assist them with their debts and to save them from the mainland kidnappers who were devastating their communities. For the Tokugawa, this was a fantastic chance to shift native Karafuto society completely away from any subservience to Qing China and place the island, and its wealth in trade and resources, directly under their auspices. They offered the Sakhalin Ainu succor and momentary safety, paying off their debt in pelts towards the mainland traders between the years 1809 and 1812. But the price they drew in exchange was a steep and impactful one. The Tokugawa forbade the Ainu from doing any direct business with the continental traders who came to ply their wares in Sakhalin, instead insisting that all trade be made in the presence of Shogunal officials in designated trading posts. The Shogunate set up guard posts around the south and west of the island to report on foreign comings and goings, and made all visiting mainland Asians stay in specified houses under watchful guard (echoing the treatment of Dutch traders in Deshima much further south in Nagasaki). The hundreds of years of Sakhalin Ainu economic independence, which had seen the Ainu venture as far as Kamchatka and Beijing, had ended. It had been replaced with a system of direct economic control by Japan. Disturbed by continued Russian incursions on the island and with the Sakhalin Ainu now being officially linked with Japan rather than China, the Tokugawa wasted no time in pressing their claim to Karafuto. They proclaimed Japanese sovereignty over the entirety of the island in 1807. Despite having only minimal direct presence on the island (and even then only in the south and west), the geographical and cultural connection "North Ezo" shared with Hokkaido gave the Shogunate expansionists the excuse they needed. Russia, which had never ceased sending trading missions to Sakhalin, eventually countered with their own claim on the island -- prompting Japan in 1845 to again insist upon its complete ownership of Karafuto. In the meantime, Russians continued to settle in the northern areas of Sakhalin, building churches, small towns, coal mines, and even a military outpost. A steady trickle of Japanese came to settle on Karafuto, and by mid-century many expansionist ideologues on the home islands had come to stress Karafuto as a potential source of near-boundless natural resources - a so-called "northern treasure box" for Japan. The Russians again asserted a claim on Sakhalin in 1853 despite the presence of Japanese settlements and various counterclaims. In attempt to further their claim on the whole island, the Russians established their first town in south Sakhalin, living uneasily with the Ainu over the winter, but the erstwhile settlement disbanded and its people left the island in 1854 in response to the Crimean War breaking out. Despite this contention, Russo-Japanese relations had actually become significantly better throughout the mid-19th century - something which might explain the lack of direct confrontation over competing claims for Sakhalin. Simultaneously, as the midpoint of the century approached, the political situation on mainland Japan became increasingly strained, as the Tokugawa found it harder to maintain control over rebellious daimyo lords, and to keep its island nation isolated from foreigners. This all culminated in the 1854 arrival in Tokyo Bay of Commodore Perry of the United States and his "Black Ships." American gunboat diplomacy saw the Tokugawa finally acquiesce to the opening of Japan to foreign trade. 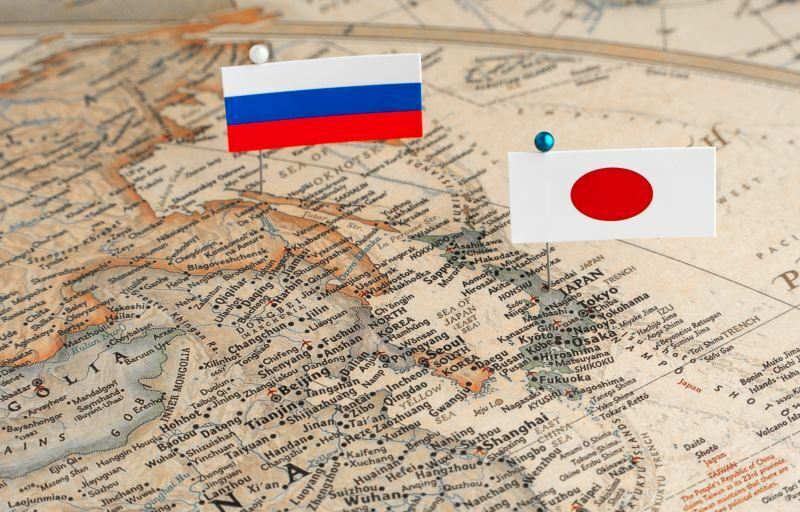 Russia was one of the first countries in line to establish direct relations with the the formerly closed-off Japanese. The Treaty of Shimoda, signed between the Russian Empire and Tokugawa Japan in 1855, did just that - and one of its most important aspects was finally creating delineations between Japanese and Russian territory in the North Pacific. The Kuril Islands were split between the two countries on a North-South basis, but Sakhalin, deemed too complicated with its multiple conflicting claims and importance to both countries, was saved for another day. In the meantime, Russians were granted the ability to settle in the north of the island and Japanese to the south, but no official boundary was enforced between the two countries. Although a weakening Qing China, hot off its embarrassing loss in the First Opium War, finally ceded all claims to the island, Sakhalin still entered a strange state of diplomatic limbo - nebulously belonging to both Japan and Russia. The 19th century was a time of continuous upheaval and change. Within a decade of the opening of Japan and the Treaty of Shimoda, the Tokugawa government had fallen and the age of the samurai had come crashing down. In their place was the Meiji Government, a new, modernizing imperial government that sought to reinforce and define its borders within a increasingly colonial world. Part of this included the full colonization of Hokkaido (which had recently seen a short-lived samurai republic on the island suffer defeat at the hands of the encroaching imperialists). The Fall of Ezo, Japan's "Samurai Democracy"
How Japan's samurai resistance fell to the pressure of history - and how its founder went from hatred traitor to respected leader. Attempts were made at solidifying Karafuto as Japanese as part of this colonizing project. These included the Hokkaido Development Agency trying to convince ex-samurai farmers to settle in Karafuto and other northern domains (although these attempts largely ended in failure). And while the Tokugawa hadn’t pressed the issue of the Ainu on Sakhalin during their recent debates over Sakhalin/Kuril ownership with the Russians, the Meiji did otherwise, arguing that Ainu presence on Karafuto, with the Ainu having been subjects of the Matsumae, represented a further Japanese claim to the island. But despite attempts to further Japanese settlement in Karafuto and to extract its resources, the new Meiji state was simply too focused on other issues, and the northern island was finally deemed too unproductive, its situation too difficult to maintain. They sent Takeaki Enomoto, famed naval officer (and former president of the aforementioned short-lived breakaway Republic of Ezo), to distant St. Petersburg. His mission was to negotiate for some sort of solution to the issue of the undefined Russo-Japanese borders in the North Pacific. A year of intense negotiation commenced. The story of the samurai who fought the rise of modern Japan to the end - and who, when all else failed, founded his own nation-state. In 1875, the Meiji discarded Karafuto. The Treaty of St. Petersburg ceded Sakhalin to the Russians in exchange for full ownership of the Kuril Islands. Japanese on Sakhalin were given some compensation and were evacuated from the island. But they were not the only evacuees. About a third of the Sakhalin Ainu were forcibly moved from their homes on the island to a community on northern Hokkaido, where many languished and died of disease. This began a renewed period of tragedy for the Sakhalin Ainu, and those few that were able to survive only managed to return to their homes in 1906 following Japanese re-annexation of southern Sakhalin after victory in the Russo-Japanese war (in which 64 Ainu fought with distinction). Tragically, the Ainu would again be removed from their homes less than 40 years later, when the island once again switched hands following Japanese defeat in WWII. Sakhalin was finally, fully Russian. In a development that would color Russian perception of Sakhalin for many years, A major katorga (ка́торга), a sort of prison labor camp and forerunner of the Soviet gulag, was set up on the island with the intention of using forced labor to help develop the sparsely populated territory. Political and other prisoners and exiles from throughout the Russian Empire were banished to Sakhalin, a land as far as one could possibly be sent from the Russian cultural hearth, thousands of miles away. The reconstruction of Sakhalin into a land of exile had an effect on the native peoples there as well; Nivkh were often employed in the katorga as guards, their tracking abilities harnessed to hunt down prison escapees. Sakhalin would soon have an especially famous visitor. Anton Chekhov, famed playwright, made the long journey to Sakhalin in 1890 with the intention of meeting with the prisoners there. His ostensible purpose was recording a census, but Chekhov himself suggested in his writings that this was merely a cover for his real goal: what we would now call investigative journalism. There were times I felt that I saw before me the extreme limits of man's degradation. Chekhov witnessed floggings, the misuse of funds and supplies, abject poverty, and even the forced prostitution of women. His travelogue of his experiences in Sakhalin, which were highly critical of the local administration, were published upon his return, and went on to have a great influence. Now, well over a century after Chekhov’s journey, its impact remains. Akhil Sharma of the New Yorker recently called Chekhov’s Sakhalin Island "the best work of journalism written in the nineteenth century," and Japan’s most internationally successful author, Haruki Murakami, referenced Chekhov’s time in Sakhalin in his well-known 2009 novel IQ84. By 1904, almost 30 years hence from the beginning of imperial Russian rule, Sakhalin had a population of around 30,000 - mostly Russian settlers, although smaller numbers of Nivkh, Oroks, and Ainu remained. The island had gained an ill reputation in Russia, in no small part thanks to Chekhov. It was a harsh, distant, and barren land of corrupt administrators and cruelly-treated prisoners - a far cry from the "treasure box" the Japanese had earlier envisioned it as. But the story of Sakhalin was far from finished. In its very near future lurked war, and the return of the Japanese, from whence the island would see the making and unmaking of a new identity for over 300,000 Japanese settlers when Sakhalin again became Karafuto - and, for a time, the 48th Prefecture of Japan. Morris-Suzuki, Tessa. Northern Lights: The Making and Unmaking of Karafuto Identity. The Journal of Asian Studies Vol. 60, No. 3. August, 2001. Irish, Ann B. Hokkaido: A History of Ethnic Transition and Development on Japan's Northern Island. McFarland, 2009. Print. Noah Oskow is a professional Japanese translator and interpreter who holds a BA in East Asian Languages and Cultures. He has lived, studied and worked in Japan for nearly seven years, including two years studying at Sophia University in Tokyo and four years teaching English on the JET Program in rural Fukushima Prefecture. His experiences with language learning and historical and cultural studies as well as his extensive experience in world travel have lead to appearances at speaking events and popular podcasts. Noah is currently working on his Masters Degree in Global Studies at Leipzig University in Germany. How a mysterious frontier island peopled by "barbarians" became one of the four main islands of Japan - and how the original inhabitants suffered as a result.